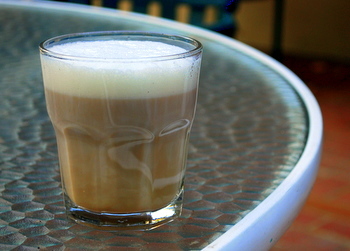 At some coffee shops, a “cafe vanilla” is another name for a vanilla latte. I tend to think of a cafe vanilla as coffee flavored with milk and vanilla syrup. I like steamed or otherwise frothed milk in mine, but straight milk will do just as well. Heat up your milk in the microwave for a few seconds if you aren’t going to steam it, otherwise you might cool down your coffee a bit too much. I used some homemade vanilla coffee syrup to finish this drink off. The recipe is easy and can be adapted to any size mug. Fill up a mug 2/3 full with freshly brewed drip coffee, stir in about two tablespoonfuls of vanilla syrup, then add milk to the top and enjoy!